What other time of the year it is to share this lovely recipe but now. Tomato and ata rodo jam, For some years now, I kind of make it a duty to make my own chutney or jam around Christmas time. Last year was epic, as I made sure every food on my Christmas menu was home-made including the drinks. I was so proud of myself and I kinda felt like a superwoman. This year’s jam is tomato and ata rodo jam (scotch bonnet chill) and the first thing I ate it with was smoked fish and grilled plantain. It felt like heaven in my mouth but the chilli hit me at the back of my throat and brought me back to life, Lol. 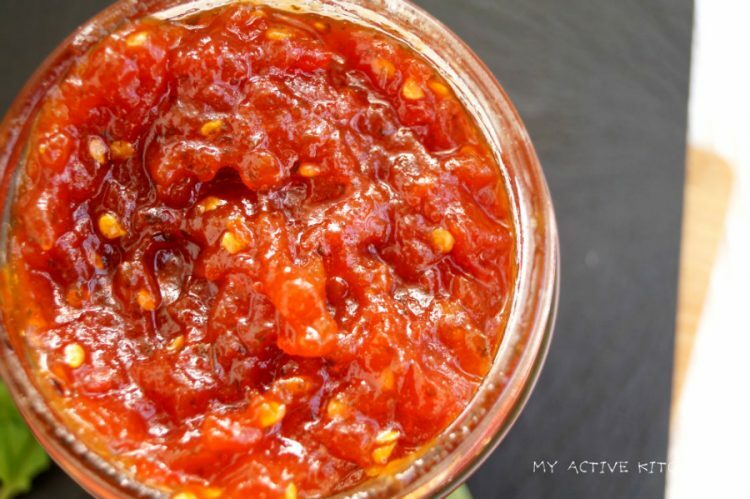 This jam is easy to make and you don’t need preservatives at all, the bonus point for this yummy fiery jam is; it keeps well and tastes amazing each time you use it. If you are looking for a perfect Christmas gift that speaks volume, then this is made just for you. It is versatile and delicious and can be used as a dip or with other grilled and fried foods and it’s also perfect with sandwiches too. Let’s get jamming people as we haven’t got all day. Place a pan on a medium heat and add the chopped tomatoes, scotch bonnet, sugar and ginger and half a cup of water and bring to boil on low heat. Add the vinegar and continue to cook until it reduces to a thick jam, glossy and keep a close eye on it to avoid burning. Have a merry Christmas y’all!